Will public photography soon be impossible in Europe? A new proposal being submitted in the European Union parliament may mean almost that. “Freedom of Panorama” is a a term we don’t hear frequently, but its importance is vital to the photography community. In short, Freedom of Panorama is a part of copyright law that gives individuals the freedom to create works of art (whether they be paintings, family snapshots, professional images, videos, etc.) in public. The specifics vary from country to country, but, in many places around the world, this is allowed for both personal and commercial use. However, opponents within the EU want to pass legislation removing this freedom in all European countries. This would mean that, when taking any photograph or creating a video in public, you must obtain the permission of the copyright holder for any copyrighted work that may appear in it, including buildings, landmarks, and works of art. How does this affect John Q. Public? Glad you asked. Let’s explore. In Europe right now, there are varying laws from country to country, but most have Freedom of Panorama. In the graphic above, dark green represents countries that already have complete Freedom of Panorama. Light green represents those countries where Freedom of Panorama extends to buildings only. 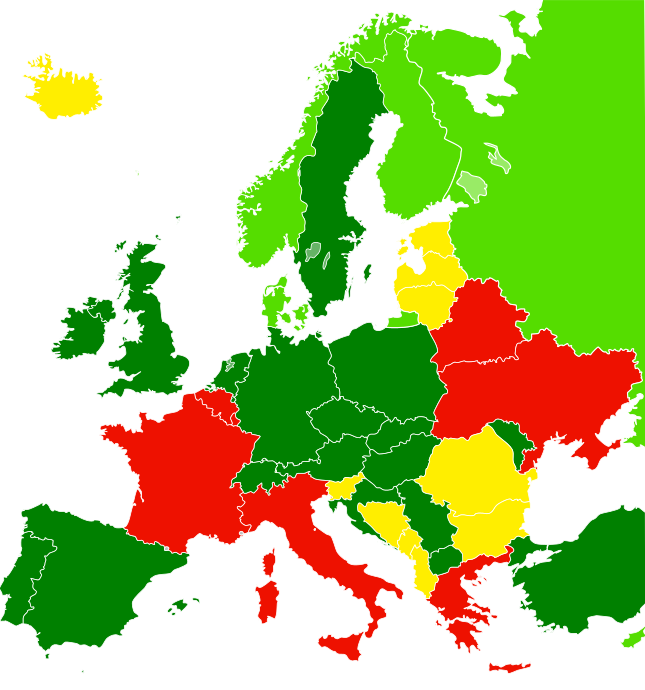 Yellow countries allow for the “publication of pictures of public artworks only for non-commercial purposes.” Red represents countries with no Freedom of Panorama whatsoever. Julia Reda is a member of the EU parliament, and she is fighting strongly to get Freedom of Panorama across the entire continent. However, the new proposal would transform all of Europe into yellow or red. So, how does this affect you, again? Let’s say that you took a photo of the London skyline. Let’s say you wanted to share that image on your blog and social media. The new proposal would require that you obtain written permission from a copyright holder for every piece of intellectual property visible in the image. You would have to track down the designer of every landmark, the architect of every building, etc., and request their permission to publish or use your photo. “But, I’m just taking snapshots on our backpacking trip this summer. That doesn’t count as commercial usage!” Sure…until you share them sites like Facebook. Part of the Facebook terms of service states that, by uploading your photos, you are giving Facebook (clearly a commercial entity) permission to use your photos commercially. The mere act of sharing your images on Facebook would be a violation without having tracked down the rights holders and obtained permission. As Reda details on her website, “You then have to conclude a licence agreement with the rightholder or responsible collecting society that explicitly allows the commercial use of the picture by Facebook before you can legally upload your holiday pictures to Facebook.” …or any other social media or photo sharing website with a similar clause. “A restriction to Freedom of Panorama to non-commercial use would therefore bring millions of Europeans into conflict with copyright law over their perfectly harmless, everyday online usage,” making them liable not only for civil judgements but criminal prosecution as well. Reda also points out that when laws changed to extend copyright protection from 50 to 70 years after the creator’s death, it took effect retroactively. Suddenly, many works across multiple mediums became in violation of the new terms. So, five years ago you published a photo book of your tour through Europe? Well, until you obtain written permission from all copyright holders of works visible in your images, your book would be in violation and would have to be pulled. You shared images on Facebook from your trip to the London Olympics? Gotta take ’em down. The chaos and backlash would be staggering. Petitions are circulating the web, and one on Change.org has already reached almost 75,000 signatures at the time of this writing. Sometimes, voices can be heard, and change can be enacted. Be a voice. Photographer Sues EliteDaily Over Unauthorised Use Of Photos Portland Photographer Sues City After They Accuse Him of Trademark Violation So You Got An Invoice From My Lawyer Asking To Pay Up For The Photo You Stole… Social Media Networks Don’t Give a Flying Fudge-Nugget About Your Copyright! Exactly. That might go a long way in changing some minds. I’m not going to spend thousands of (tourist) dollars to visit a country where I cannot take pictures. I AM WITH YOU. Unfortunately there are too many idiots who do not think rationally. Who knows how they think. It is like the people that have put up all of the barriers at the zoos so not one can take any pictures anymore. Crazy. If a landmark/building gets displayed in a photo it’s just free advertising. *publishing* photo *not* taking photo. Why to go to Europe? Expensive and boring. If you want to restrict the use of a image of a building or landmark, why don’t you enclose the said building in a tarp so we don’t have to look at it. Who can say that an image containing a certain building that is among others, is the star of the image. Especially if that building is in a public (outside) location. This would be the same as taking a picture of any recognizable or non-recognizable person in a public setting. They are in a public setting. If you don’t want it photographed, cover it up and remove it from public view. You are an idiot Mowery!! This is not even DRAFT LEGISLATION!! The EU Parliament, actually, CAN NOT even do such! The EU commission yes, parliament.. NO! Perhaps not such an idiot…..”raising your profile” are we???? Advertising through scaremongering….. Wow…good one! I bet if someone removed/backed out such a landmark from a photo, uploaded it, and it goes viral. The copyright holder would complain that their landmark was removed from (insert city) when it should always appear. I have contacted a Dutch member of European Parliament (EP) and he responded today that he had voted against the proposal and that, in fact, a large majority of the EP voted the proposal down. So it is a non-issue.